Sometimes the best connectivity solution is realized by bringing two systems together. 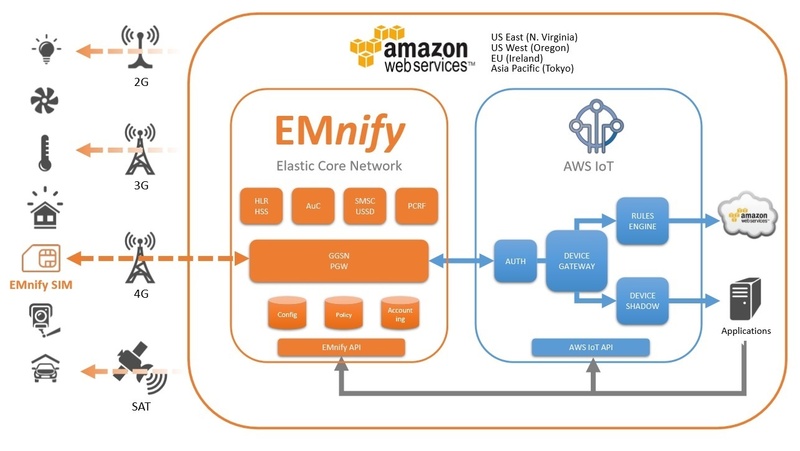 In light of this - and with the recent launch of AWS IoT out of beta - we have put together an overview of the AWS offering as well as our own EMnify Enterprise Connect (EEC) offer, showing you how they can be used together. Once you connect your devices and they are exchanging data, you also need to store that data, process and analyze it further - and possibly even initiate some action based on it. This is where the Rules Engine comes into play; here you can define rules that look at incoming data and then apply modification and finally forward to them to other devices or cloud services. EMnify M2M SIMs fit into the GSM modules of your IoT devices and come with network agnostic and operator independent mobile connectivity into 2/3/4G and satellite networks. Available in all form-factors, including the latest embedded SIM options - and industrial grade versions made for harsh environments - they are perfect for large-scale and high quality IoT projects. The “root-CA.cert” you will need to download from Symantec, you can find it at the following URL https://www.symantec.com/content/en/us/enterprise/verisign/roots/VeriSign-Class%203-Public-Primary-Certification-Authority-G5.pem, just download it and store it as “root-CA.crt". For more information about EMnify’s services please see our products page.